The multicooker REDMOND RMC-М70 is a multi-purpose device with wide range of functions, which can easily replace a stove, an oven, a yoghurt maker, a deep fryer and many other appliances. 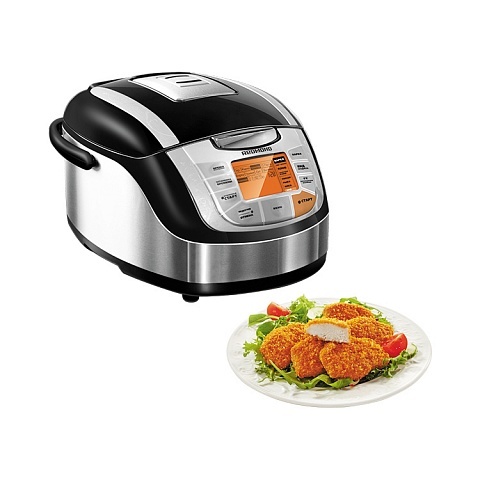 From now on you may cook soups, fry tempting meat and fish steaks, stew vegetables, steam and deep fry foods, make pastry and desserts using one compact multicooker. 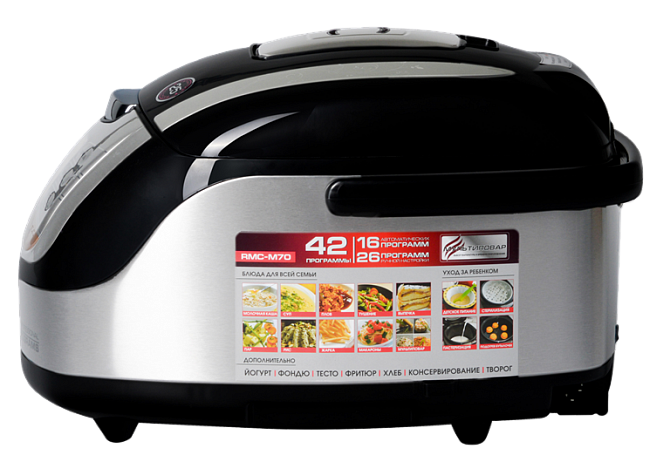 42 cooking programmes, 3D-heating technology, Keep Warm and Time Delay functions provide convenient and easy use of the multicooker and a wonderful taste of ready dishes. The programme with the manual adjustment MULTICOOK additionally extends the model features: you will be able to adjust cooking temperature and time. 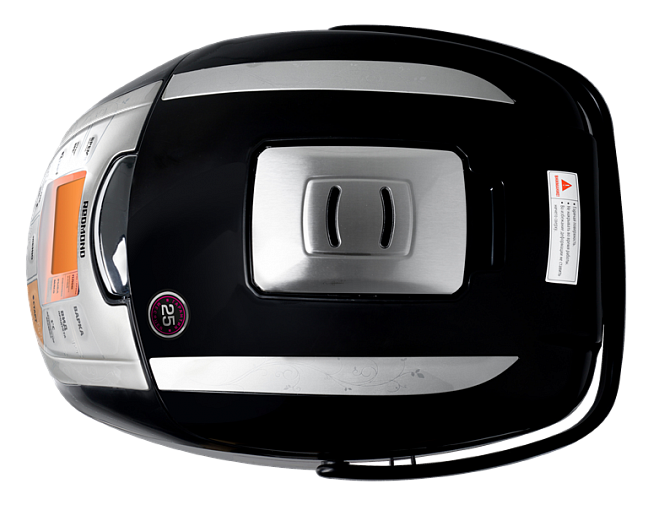 The M70 has tactile signs for visually impaired people to make cooking process in the multicooker even more convenient! + Gift cookbook with 200 RECIPES! The MULTICOOK program featured by the RMC-M70 favorably distinguishes the unit from other multicookers in the market. The program enables you to cook any meal of your choice in any traditional way, due to its wider temperature range from 35°C to 160°C with 5°C intervals. The time can be set from 5 minutes to 12 hours with the intervals of 5 minutes. Using MULTICOOK you can not only prepare meals, traditional for multicookers, but also make baby food, cottage cheese, yogurt, fondue, French fries, nuggets, pasteurize, sterilize, and bake bread. Thanks to the newest version of the MULTICOOK program, the possibilities of the multicooker are only limited by your imagination. Guided by culinary techniques used by professional chefs, REDMOND engineers created a unique kitchen appliance which can control both time and temperature. There are 42 programs: 16 automatic and 26 manual programs giving you almost endless opportunities to be creative and experiment. Each of the 16 automatic programs featured by the RMC-M70 has an exact time setting which is set automatically but can also be adjusted manually. Even when the program has finished, but the meal needs just a few more minutes to get done, you can choose to set the time for 5-10 minutes more. STEAM has 3 time settings for fish, meat, and vegetables. The time ranges from 5 minutes to 1 hour with 1 minute intervals or you can set the time manually. This program is for low-fat meals with meat, fish and poultry, cutlets, dumplings, etc. This program is great for those of you who want to eat more healthy food. FRY has 3 time settings for vegetables, fish and meat and you can manually adjust the time from 5 minutes to 1 hour with 1 minute intervals. The program can be used for frying steak, beefsteak, and other dishes from meat, poultry, or fish. You can also fry vegetables, mushrooms, or make any other side dish. PASTA is for cooking pasta, sausage, dumplings, and other semi-finished products. The time ranges from 2 to 20 minutes with 1 minute intervals. The device will sound upon boiling so you know to add the ingredients, and start the countdown. STEW meat, fish, and vegetables; making oatmeal, jellied meat, and other time-consuming dishes. You may either stick to default time settins of 1 hour or manually adjust the time from 10 minutes to 12 hours with 5 minute intervals. OATMEAL for making oatmeal using milk. The time settings for this program range from 5 minutes to 1.5 hours with 1 minute intervals. The temperature settings of the program minimize the possibility of milk boiling out while cooking. However, it also depends on the quality of milk and grain used. Find more tips and recommendations in the cookbook and user manual provided. PILAF is for cooking various pilaf. 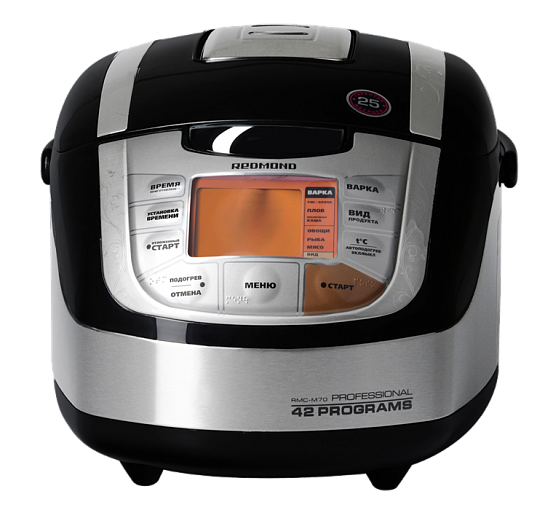 The program features temperature settings which guarantee excellent results. Time settings range from 30 minutes to 2 hours with 1 minute intervals. The program’s default setting is 1 hour. BAKE biscuits, cake, vegetable and cottage cheese pudding, and omelets. Manually adjust the time in range from 30 minutes to 4 hours with 5 minute intervals. The program default setting is 1 hour. SOUP is for making broth, various soup (chunky, bisque, cream soups etc.) as well as compote, and other drinks. Time can also be set manually from 10 minutes to 6 hours with 5 minute intervals.This program's default setting is 1 hour. All ingredients can be added at the same time, which makes the “Preset”function perfect for this program. RICE/GRAIN cooks rice, or any other grain. Manually set the time from 5 minutes to 1.5 hours with 5 minute intervals. The program default is 25 minutes. 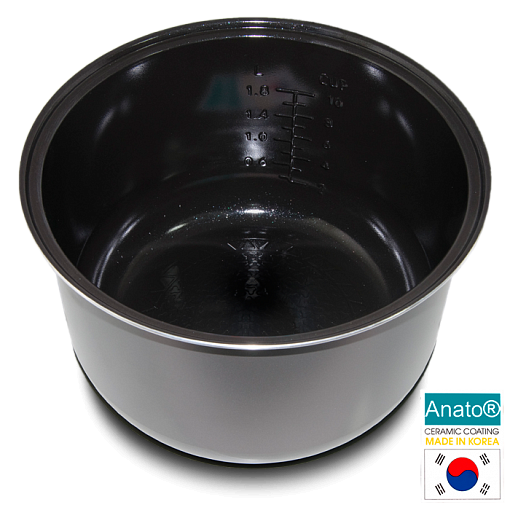 Three heating elements located on the bottom, sides, and lid of the RMC-M70 distribute heat evenly throughout the whole process so you can choose the best temperature for each program and remove excessive condensation. The RMC-M70 features a function to keep your meal warm for up to 24 hours. Have a warm meal waiting for your family when everyone gets home. Use this function to set the program to end at a certain time of day with a delay of up to 24 hours. Your meal will be ready for an early breakfast or by the time you come home from work. 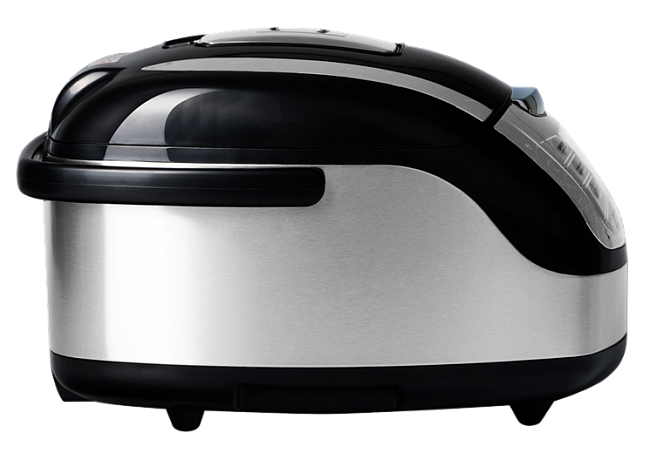 The multicooker features non-volatile memory which means your settings won’t be lost in a short-term electric outting. Created by REDMOND chefs, all recipes in this book were adapted for this particular model. Each recipe gives step-by-step instruction on the procedure, time and temperature settings, proportions, and the amount of ingredients used. The cookbook also offers tips for easily making a tastier and healthier meal for you and your loved ones.